Note that this article may be technical and if your eyes are spinning reading it, please pass it along to your web design team. Our embed codes are available in 2 formats: responsive or set width. The responsive option allows the embedded IDX iFrame to dynamically resize it's width based on the width of the browser. This is the ideal option for most non-RealtyNinja websites, especially ones that are responsive down to tablet and smart phone sizes. To access the new responsive embed codes, login to your IDX account and click "View Embed Code", the new responsive option is selected by default. 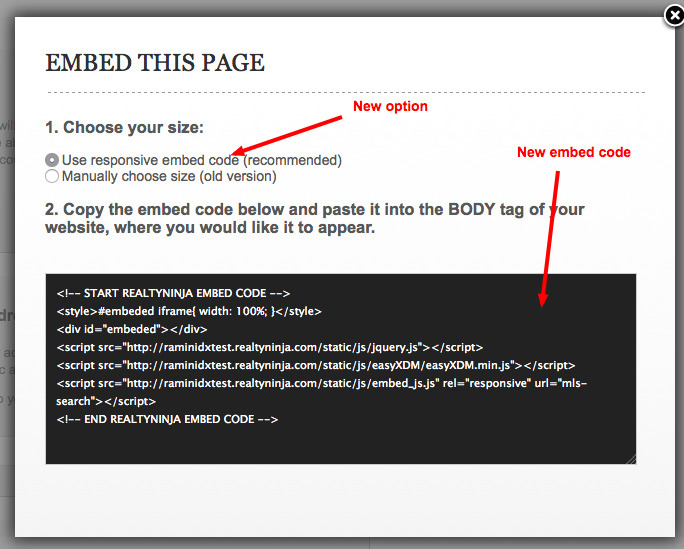 Copy the new embed code and embed (or replace) it for each page, listing or building you've embedded on your non-RealtyNinja website.